Big Beaver Hat, a new company comprised of gaming industry veterans, have launched a hybrid video game/comic book on Kickstarter called “Sword of Gary 6000”. 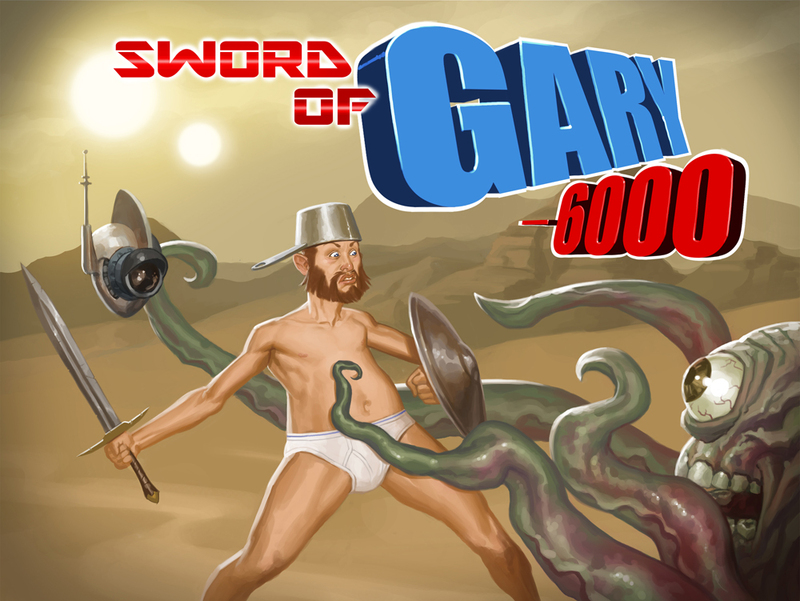 Inspired by classic 2D games, “Sword of Gary 6000” is a multi-platform sword fighting game where our hero, Gary, is accidentally chosen as Earth’s champion for an intergalactic gladiator tournament. Armed with nothing but a Ramen pot and his underwear, Gary must battle the galaxy’s finest champions to survive. With the completion of each boss battle, a new chapter of a comic forwarding the story of Gary’s attempt to stay alive, return home, and find some pants will be unlocked. The game will feature fully painted in-game animations and a completely acapella soundtrack provided by the project’s brainchild, concept artist/musician Zach Hall (Star Wars: The Old Republic, American McGee’s Alice) with the comic portions provided by comic artist/writer Benjamin Hall (Humanoids From the Deep, Dead@17: Protectorate).